Speaker: R. Johnson, Muons, Inc.
Jacobo Konigsberg has worked at CDF for over 15 years. 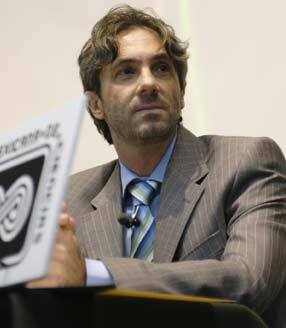 On February 2, Jacobo Konigsberg was chosen as the new spokesperson at CDF. He will replace Young-Kee Kim, who will assume her new role as deputy director for the lab on July 1. "Jaco will be excellent for the job," said Kim. "He is very systematic in his approach to projects, and he has great enthusiasm about physics and the CDF experiment." Management responsibilities are crucial in the next few years, as Tevatron luminosity is doubling while some CDF physicists will transfer to the ATLAS and CMS experiments for the LHC. "We will need to produce physics results more rapidly," said Kim. "There is no time to twiddle your thumbs." Rob Roser, cospokesperson for CDF, added, "The 2007-08 period will be especially challenging. We will have to keep the experiment staffed and organized as funding pressures shift the priority from the Tevatron. Jaco is very talented, and I know he will be up to the challenge." Konigsberg, who has worked on CDF for 16 years, started as a postdoc from Harvard University and was part of the analysis team in the top quark discovery. He helped design the luminosity monitor for Run II of the Tevatron and is now a full professor and head of the CDF group at the University of Florida. Konigsberg says he looks forward to getting started. "I like to think of the Standard Model as a pinata we are trying to hit," he said. "If we can get enough data to analyze, we just might bust it open in the next couple of years." Relativistic electron cooling of an antiproton beam has been demonstrated at Fermilab. Increasing the density of antiprotons by reducing the spread in longitudinal speeds leads to a larger collision rate in particle colliders, producing more sought-after scattering events that contain rare particles and decays. Antiprotons, made artificially by smashing protons into a metal target, must be collected on the fly and focused before they can be accelerated and collided with opposite-moving batches of protons; such proton-antiproton smashups are the premier activity at Fermilab's Tevatron facility. The more compact and tightly focused the two beams are, the more desirable high-energy collision there will be. The degree of focus and beam density is expressed in a parameter called luminosity. The Cultural Association of Italians at Fermilab presents Andrea Silvestrelli, basso-baritone, and Teresa Cullen, soprano, in recital with Eric Weimer, piano, tonight, February 8, at 8 p.m. in the Ramsey Auditorium. Tickets are $15; for more information call 630-840-ARTS (2787). What do you get when you combine a near detector from Japan, a neutrino beam from Fermilab, and throw in a dash of physicists from across the globe? The answer: SciBooNE, the SciBar Booster Neutrino Experiment. Scheduled to begin taking data in 2007, SciBooNE will use Fermilab's BooNE neutrino beam and the SciBar detector from the KEK-to-Kamioka (K2K) detector upgrade in 2003. The SciBar detector will arrive at Fermilab in late summer 2006 and technicians will install it 100 meters from the neutrino source. This placement will allow scientists to measure cross sections of the neutrino beam before it reaches the 800-ton MiniBooNE mineral oil detector, 500 meters away. (1) processes that are interesting in their own right, especially multi-track, that SciBar will be able to make; (2) processes that are the main signal and background processes for the Tokai-to-Kamioka (T2K) neutrino oscillation experiment in Japan; and (3) processes to help scientists better understand the booster neutrino beam for MiniBooNE. Wascko adds that SciBooNE measurements will be a good complement to the MINERvA measurements at higher neutrino energy, and give the lab a more complete neutrino program. "SciBooNE has the unique ability to reconstruct final state particles with great precision, especially multi-particle final states," he says. "Those processes give detectors like MiniBooNE or Super-K the most trouble." Researchers eagerly await the announcement of the MiniBooNE neutrino results, which will influence not only the future BooNE beam configuration but also the second phase of the BooNE project. International Folk Dancing will meet Thursday, February 9, at Kuhn Barn on the Fermilab site. Dancing begins at 7:30 p.m. with teaching and children's dances earlier in the evening and request dancing later on. Newcomers are welcome and you do not need to come with a partner. Info at 630-584-0825 or 630-840-8194 or folkdance@fnal.gov. Milk Pail Dinner Theater presents the Mardi Gras Murder Mystery on February 11 at 7:00 p.m. Discount price is $50.00 per person (reg. $60.00). The Milk Pail Theater is located in East Dundee. Chicago Blackhawks Discount tickets for the March 15, March 29 and April 16 games are half off. Tickets are for the 300 level. Order forms can be found in the Recreation Office or on the website.